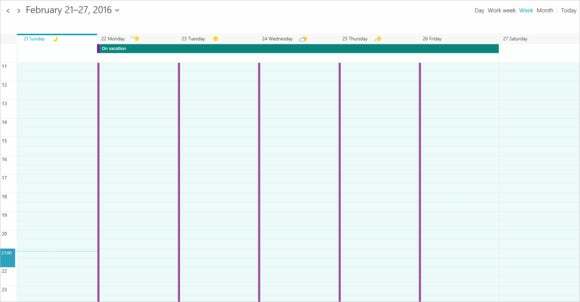 Outlook will cancel recurring meetings and block out your calendar so you don't have to call in from the beach. You’re a nice person: devoted, hardworking. And every year you find yourself taking an hour or two from your vacation to stress about some petty meeting someone else should be taking. 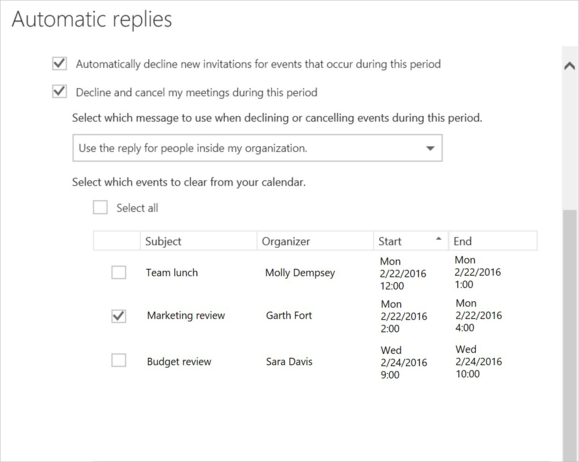 An updated Automatic Replies feature from Outlook promises to put you back on the beach. Microsoft’s old “Out of Office” feature simply sent automated emails to friends and business contacts, reminding them you’d be lounging on the sands of Cancun the second week of July. Now, Outlook wipes your calendar clean: cancelling meetings you’ve already booked, declining new invitations, and showing your calendar as blocked (or filled up) for the duration. It’s Outlook acting as the devoted gatekeeper we all wish we had. You’ll have the option to completely free yourself from meetings if you so choose. 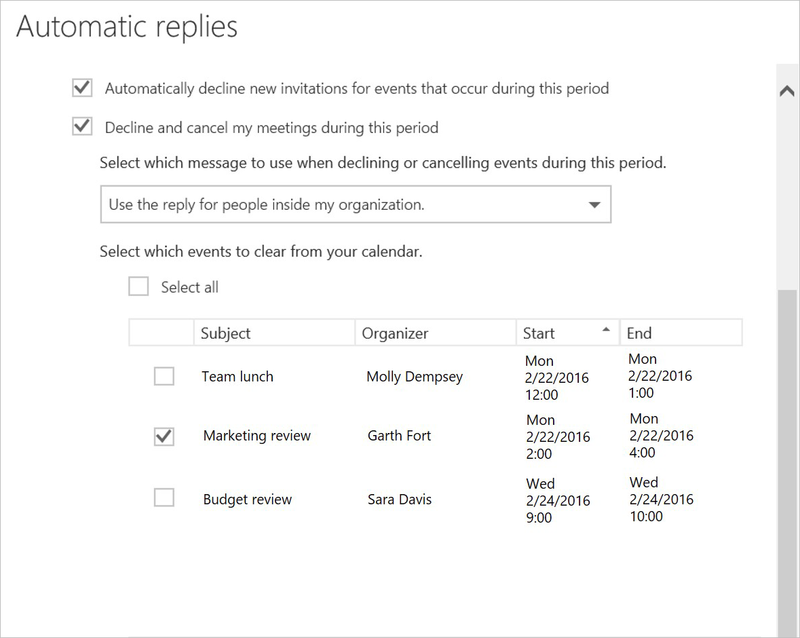 Once you enable what Microsoft calls Automatic Replies, Outlook will show you a list of scheduled meetings that take place during your vacation and, via a checkbox, allow you to send a polite email opting out of the meeting. A similar email will be sent if a new meeting invitation arrives. Outlook will also block out your schedule, showing you as unavailable. Naturally, don’t expect this feature to be available to just every Outlook user. You’ll have to subscribe to Office 365, Microsoft’s recurring business subscription, if you want to professionally tell your work colleagues that you’ll be enjoying a few well-deserved days off. (In other words, this feature isn’t available if you use just the standalone version of Office 2016.) It is also available, though, via Outlook.com -- which, just to be clear, is free and does not require an Office 365 subscription to take advantage of the new features. The implication is that you should manage your respective work and personal calendars with two separate services. There’s one hitch: Even if you subscribe to Office 365 and use the standalone Office apps, the only way to enable these additional features is to log in to your work or personal Outlook email via a browser. From either the Mail or Calendar view within Outlook, go up to the gear icon (Settings) in the upper right and click Automatic Replies. 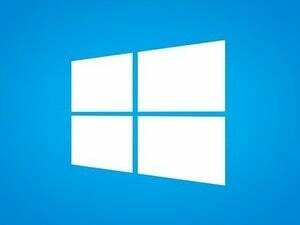 Microsoft said it may add these options within other applications, such as the Android or iOS versions of Outlook, in the future. Why this matters: Part of the worry about going on vacation is that you “pay” for your time off, either with more work before or after your vacation. Microsoft may not be able to do anything about that, but as your holiday draws nearer, at least your colleagues will be reminded that someone else will need to pick up the slack. 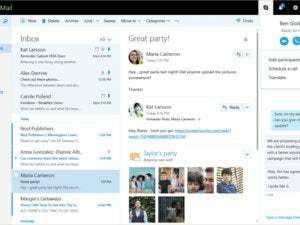 This article was updated at 9:13 AM on April 15 to clarify that Outlook.com users can take advantage of the new feature without the need for an Office 365 subscription.